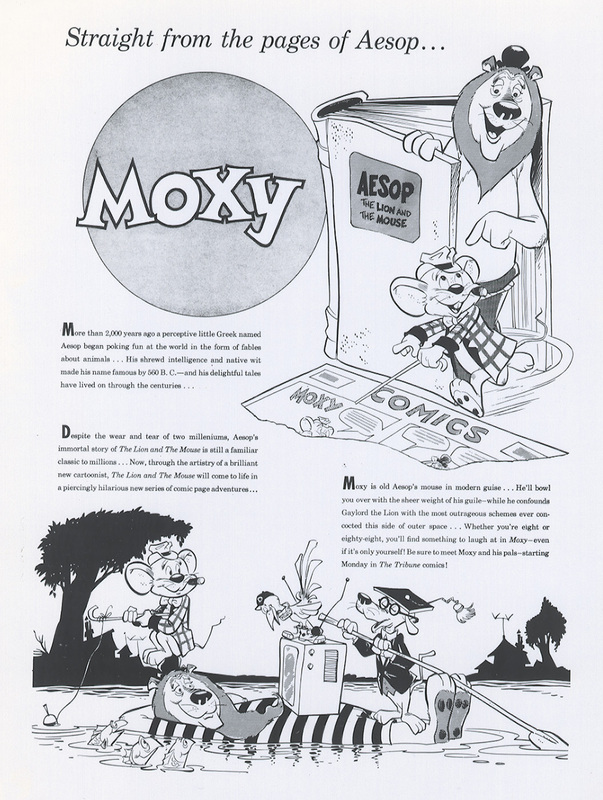 The Fabuleous Fifties: Moxey M.
As part of my trip to the US I stayed a couple of days in Columbus, Ohio to visit the Billy Ireland Cartoon center, which has one or the largest collections of donated art by people from the cartoon and comic strip community, as well as the complete newspaper archives of the Francisco collection from Bill Blackbeard. 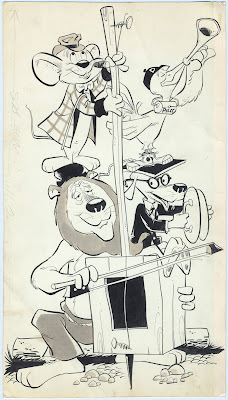 They also had a huge collection of stuff that must have come from artist David Gantz himself, because it not only contained samples and clippings from his two most famous newspaper strips, Dudley D. (follow the link for samples) and Don Q. (which I have never been able to get hold of, so I haven't shown it yet). 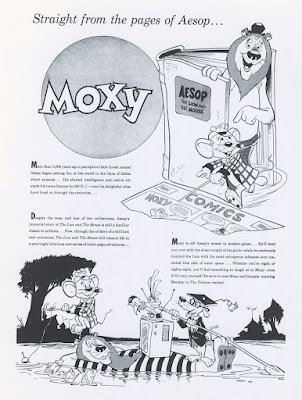 There were also a lot publicity materials from a strip I always believed had remained unsold, Moxy. Early versions of this charming strip about a Mouse and a Lion (equally inspired by Aesop's Fables and Pogo) had appeared in the short run Family comics, a mock Sunday newspaper which was produced by Zek Zekely for Californian grocery stores (again, follow the link for a complete sample). After that he tried to sell it to a syndicate and when that worked, they tried to sell it to newspapers. In the files at the Ohio State University was a whole sheet of newspaper ads, with actual papers named. So either it was sold and disappeared quickly or it was retracted just before the actual start because of insufficient papers joining in. 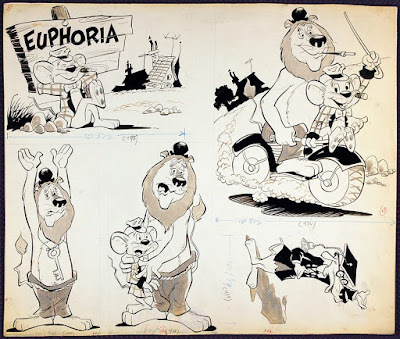 Anyway, I plan to do larger article about those, but I though this would be a a great opportunity to show you two pieces of original promotion art made for this strip by Davind Gantz as well as a promotional one-sheet. 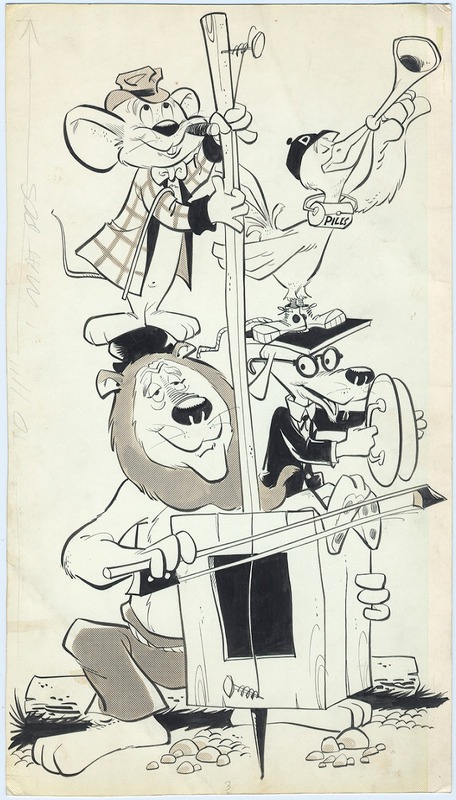 The latter one was also in the Ohio collection, but I got these from various Internet sources. Also included in the library was a complete daily story in black and white proof, which I hope will one day be available.